Samuel Jacob Bradford (born November 8, 1987) is an American football quarterback who is a free agent. He has played in the National Football League (NFL) for the St. Louis Rams, Philadelphia Eagles, Minnesota Vikings, and Arizona Cardinals. Bradford attended Putnam City North High School in Oklahoma City, where he starred in football, basketball and golf. As a senior quarterback in 2005, he threw for 2,029 yards and 17 touchdowns in 12 games. Bradford was not highly recruited coming out of high school, but he did receive a scholarship offer from the University of Oklahoma, which he accepted. After a redshirt season in 2006, Bradford threw for 3,121 yards and 36 touchdowns as a redshirt freshman. In 2008, Bradford became only the second sophomore to win the Heisman Trophy as he led the highest-scoring offense in NCAA history, throwing for 4,464 yards with 48 touchdowns and just six interceptions. He again led the nation in passing and also added five rushing touchdowns as the Sooners went 12-1 and advanced to the BCS national title game. Bradford declared for the NFL Draft following the 2009 season and was drafted by the St. Louis Rams with the first overall selection in the 2010 NFL Draft. That year, Bradford set the record for most completions by a rookie in NFL history, which helped earn him the NFL Offensive Rookie of the Year award. Prior to the start of the 2015 season, the Rams traded Bradford along with a 2015 fifth round pick to the Philadelphia Eagles in exchange for quarterback Nick Foles, a 2015 fourth-round pick, and a 2016 second-round pick. Following his 2015 campaign with the Eagles, in which he set career-highs in passing yards (3,725), completion percentage (65%) and yards per attempt (7.0), the Minnesota Vikings acquired Bradford after their starting quarterback Teddy Bridgewater was lost to a season-ending knee injury before the start of the season. Bradford was born to Kent and Martha Bradford in Oklahoma City, Oklahoma. He attended Putnam City North High School in Oklahoma City, where he starred in football, basketball, baseball, and golf for the Putnam City North Panthers. Bradford played as a pitcher in baseball, but gave up after his freshman year. He earned All-City honors as a junior quarterback in football by The Oklahoman. Following his senior season in which he threw for 2,029 yards and 17 touchdowns in 12 games, Bradford was named to the Oklahoma Coaches Association All-State Team and was a Second-Team All-State pick by The Oklahoman. Bradford was also a Division I-caliber basketball player. As a senior, he averaged 18.6 points and 10.5 rebounds per game and played on the same elite AAU team as fellow Oklahoma City native and Detroit Pistons star Blake Griffin. In golf, Bradford defeated future PGA touring pros Kevin Tway and Robert Streb during his high school career. In addition to the aforementioned sports, Bradford also played hockey in his youth. In 1999, when Bradford was 12, his travel team, the Junior Blazers, won a regional championship, beating a team from Houston. He quit the sport that same year, and according to his former hockey coach Mike McEwen, who played on three Stanley Cup championship teams with the New York Islanders, Bradford had the talent to make it in the NHL. McEwen also said that Bradford was one of the best players he ever coached. In the spring of 2005, by the end of Bradford's junior season, he garnered interest from several Division I programs, including Stanford, Michigan, Texas Tech, and nearby Oklahoma. Following his senior season, Bradford was viewed as a two-to-three-star recruit and was not that highly ranked among the high school class of 2006, with his highest ranking being No. 12 among only pro-style quarterbacks by recruiting source Rivals.com. Bradford was ranked behind Pat Devlin, "Juice" Williams and Josh Freeman, and was overshadowed by the likes of five-star recruits like Mitch Mustain, Matthew Stafford and Tim Tebow. "2006 Oklahoma Football Commitment List". Rivals.com. Retrieved September 21, 2016. "2006 Oklahoma College Football Recruiting Commits". Scout.com. Retrieved September 21, 2016. "Scout.com Team Recruiting Rankings". Scout.com. Retrieved September 21, 2016. "2006 Team Ranking". Rivals.com. Retrieved September 21, 2016. Bradford received an athletic scholarship to attend the University of Oklahoma, where he played for coach Bob Stoops's Oklahoma Sooners football team from 2006 to 2009. He redshirted as a freshman in 2006 before becoming the starter in 2007 and turning in one of the best seasons ever by a quarterback, passing for 4,720 yards with 50 touchdowns and just eight interceptions. As a result, he won the Heisman Trophy, becoming the fifth Oklahoma player to win the award. After Oklahoma lost the 2009 BCS National Championship Game 24-14 to Florida, Bradford, instead of declaring for the upcoming draft, elected to return to Oklahoma for another crack at the title. He ended up playing in just three games due to a shoulder injury, and the Sooners, ranked No. 3 to start the season, finished with an 8-5 record. In 2006, Oklahoma's starting quarterback Rhett Bomar, then a sophomore, was dismissed from the team for violating NCAA rules. Paul Thompson, a senior quarterback-turned-wide receiver, converted back to quarterback and led the 2006 Oklahoma Sooners football team to win the Big 12 Championship Game. His departure left a void at the quarterback position at Oklahoma. Six players on the roster tried out for the starting position during the following off-season, including three walk-on quarterbacks, true freshman Keith Nichol (a Rivals.com 4-star recruit and 6th-ranked dual-threat quarterback in the 2007 recruiting class, who later transferred to Michigan State University), junior Joey Halzle (the only one with game experience), and Bradford, a redshirt freshman. On August 21, 2007, Bradford won the starting quarterback role for the 2007 team. In his first game for the Sooners, against the University of North Texas, Bradford completed 21 of 23 attempts for 363 yards and three touchdowns in a little over two quarters, breaking the school record for passing yards in a half, held by his quarterback coach Josh Heupel, with 350. The very next game, Bradford broke Heisman Trophy winner Jason White's school record for most consecutive pass completions with 22 (18 came in the first half and four at the start of the second). In the second week of the 2007 season, Bradford was named the national offensive player of the week by the Walter Camp Football Foundation after tying the school record for most touchdown passes in a game with five. Having thrown 25 touchdowns through his first nine games, Bradford was on pace to break the NCAA freshman record of 29 touchdowns set by David Neill in 1998 and tied by Colt McCoy in 2006. In the November 17, 2007 game against Texas Tech, Bradford suffered a concussion of unknown severity. He was removed from the game and replaced by back-up quarterback Joey Halzle. The Sooners lost the game, 27–34. Bradford was able to play in the Bedlam game against Oklahoma State on November 24. During the November 24, 2007 game against the Oklahoma State Cowboys, Bradford broke the NCAA freshman record of 29 touchdowns by passing his 30th touchdown to Joe Jon Finley during the second quarter. At the Missouri Tigers game, Bradford threw for 209 yards and 0 interceptions. He was 18–26 and threw for two touchdowns. The Sooners won the Big 12 Championship after defeating Missouri for the second time in a season. The Sooners played the West Virginia Mountaineers in the Fiesta Bowl on January 2, 2008 and lost 48–28. It was Bradford's first Bowl Championship Series game as a starter. Sam Bradford during the 2008 NCAA season. In week 8 of the following season against Kansas, Bradford surpassed quarterback coach Josh Heupel's school record for passing yards in a single game with 468 yards. Bradford led the Sooners to their third straight Big 12 Championship and defeated Missouri 62–21. In the process, the Sooners broke Hawaii's 2006 record for the most points in a single season with 702 points. Also, the Sooners were the first team in NCAA history to score 60 or more points in five straight games. Oklahoma finished the 2008 regular season with a 12–1 record, ranking #2 in the AP Poll and #1 in the BCS Standings. The Sooners earned a trip to play Florida at the 2009 BCS National Championship Game. After the regular season, Bradford captured the Davey O'Brien Award and the Heisman Trophy. He is the second sophomore, after 2007 winner Tim Tebow of the University of Florida, to receive the Heisman; he also became the fifth University of Oklahoma player, as well as the second person of Native American descent to capture the trophy after Jim Plunkett. Bradford received 1,726 total points while the other finalists, Colt McCoy, of the University of Texas, and Tim Tebow, received 1,604 and 1,575, respectively. Tebow, however, collected more first-place votes, 309, while Bradford got 300. Bradford got the most points thanks to the help of his 315 second-place votes. A total of 926 voters participated in the balloting. When combined with Blake Griffin's Naismith Award, Oklahoma became the first school to have a winner in both top basketball and football individual awards in the same year. Bradford was also voted Associated Press College Football Player of the Year. Bradford received 27 votes, again beating McCoy (17 votes) and Tim Tebow (16 votes). 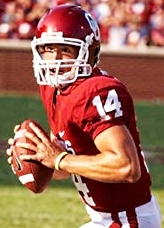 Bradford is the third Oklahoma Sooner to win the award, joining Josh Heupel (2000) and Jason White (2003). Heupel and White were also quarterbacks, with Heupel being the current quarterbacks coach for Oklahoma. Bradford faced Florida, led by Tebow, in the 2009 BCS National Championship Game. He threw 26-of-41 passes for 256 yards, two touchdowns, and two interceptions, as Florida won the game 24–14. Bradford announced that he would forgo the 2009 NFL Draft to return to Oklahoma for his junior season. In the Sooners' first game of the season (against Brigham Young), Bradford suffered a third-degree AC joint sprain one play after becoming Oklahoma's all-time passing leader. Playing without Bradford for the second half of the game, Oklahoma went on to lose 14–13. Bradford was originally scheduled to return in about three to six weeks, but head coach Bob Stoops initially refused to either confirm or deny that timetable. After missing three weeks, Bradford returned to the field during the Baylor game, and completed 27 of 49 passes for 389 yards and one touchdown, leading the Sooners to a 33–7 victory. Bradford re-injured his right shoulder on October 17, 2009 in the Red River Rivalry against Texas on the second drive of the game. It was later announced that he would undergo season-ending shoulder surgery and enter the 2010 NFL Draft. Although he likely would have been one of the first quarterbacks taken in the 2009 NFL Draft, Bradford decided to return to Oklahoma for his junior season in January 2009. Shortly after the 2009 draft, he was projected as the No. 1 prospect for the 2010 NFL Draft. On October 25, 2009, Bradford announced he would forgo his final year at Oklahoma and enter the draft. Commonly considered one of the top prospects available, Bradford was projected as high as the No. 1 overall pick for most of the preseason and the early part of the regular season. Because of his shoulder injury, Bradford did not throw at the 2010 NFL Combine, however he was measured and participated in interviews and medical examinations. He was measured at 6'4¼" and 236 pounds, about 15 pounds above his college playing weight. Bradford scored 36 out of 50 on the Wonderlic test, well above the average of 28.5 for the 30 NFL quarterbacks slated to start in 2010. On March 19, Bradford met with St. Louis Rams general manager Billy Devaney and offensive coordinator Pat Shurmur in Pensacola, Florida, where he had been training and rehabbing since undergoing surgery on his throwing shoulder. In early Spring, Bradford met with Thom Goudy, a professional development coach in St. Louis, Missouri. Goudy helped Bradford with his pocket technique. Bradford spent three weeks in his training camp before starting the summer conditioning camp. On April 22, 2010, Bradford was selected by the St. Louis Rams as the first overall pick in the 2010 NFL Draft. It was the first time the Rams selected a quarterback in the first round of a draft since the selection of Bill Munson in the 1964 NFL Draft. Bradford is the first No. 1 pick out of Oklahoma since Billy Sims was selected top overall by the Detroit Lions in the 1980 NFL Draft. Bradford chose the #8 in honor to Troy Aikman who also attended Oklahoma before transferring to UCLA. On July 30, 2010, Bradford signed a six-year, $78 million deal, which has $50 million of guarantees and has a maximum value of $86 million making it the largest contract ever for an NFL rookie. In the preseason opener against the Minnesota Vikings on August 14, Bradford went 6-of-13 for 57 yards and was also sacked 3 times in a Rams loss. After another unimpressive showing against the Browns in his second game, Bradford bounced back in a big way against the Patriots in the third game of the preseason. He got his first start in place of the injured A. J. Feeley, throwing two first half touchdowns and helping lead the Rams to a 36–35 victory. He competed for the starting quarterback position with Feeley and on September 4, Bradford was named the starting quarterback for the 2010 season opener. On September 12, 2010, in his first regular season game as the starting quarterback for the Rams, Bradford completed 32/55 passes for 253 yards, 1 touchdown and 3 interceptions in a 17–13 loss to the Arizona Cardinals. His first NFL touchdown came on a 1-yard pass to Laurent Robinson. Two weeks later, he then achieved his first victory as an NFL starter when the Rams defeated the Washington Redskins in an upset by a score of 30–16, which snapped a 13-game overall home losing streak. The next week, he passed for 289 yards and two touchdowns in leading the Rams over the Seahawks, 20-3. This was their first win in a division game since November 2007. In Week 8 against the Carolina Panthers, Bradford connected on 25 of 32 passes, two of them for touchdowns. In his first eight games, he scored eleven touchdowns, which tied an NFL record—held by Dan Marino (1983), Peyton Manning (1998), and Ben Roethlisberger (2004)—for over that span by a rookie since the AFL–NFL merger in 1970. Bradford went 3-2 as a starter in October, passing for 1,019 yards and 7 touchdowns against 3 interceptions. He was named the NFL's offensive rookie of the month. During October and November, he established a record for most consecutive passes without an interception for a rookie (169), which ended with an interception by William Moore in a home game against the Atlanta Falcons on November 21. On November 28, 2010, against the Denver Broncos, Bradford became the first rookie in NFL history to pass for at least 300 yards and three touchdowns with no interceptions during a road victory. He capped November by becoming the first rookie quarterback to win two consecutive Offensive Rookie of the Month awards. On December 26, Bradford surpassed Peyton Manning's record for most completed passes by an NFL rookie quarterback (326). Bradford finished the season with 354 completions out of 590 attempts, surpassing Manning's record of 575 for most attempts by an NFL rookie quarterback. Bradford became just the third rookie quarterback to start all 16 regular season games and pass over 3,000 passing yards, joining Peyton Manning and Matt Ryan. Coming into the 2011 season, expectations were high for the St. Louis Rams and Bradford. After going 4-0 in the preseason, it appeared as if they would be fulfilled, but once the regular season rolled around injuries ravaged the roster. A high ankle sprain bothered Bradford for the majority of the year and he finished with 2,164 passing yards, six touchdowns, and six interceptions. The team went 1–9 in games he appeared in and had a 2–14 record overall. During the off-season, there was much speculation that the Rams would select Heisman Trophy winner and former Baylor quarterback Robert Griffin III. But, new head coach, Jeff Fisher instilled hope that Bradford was still the Rams franchise quarterback, solidifying this hope when the Rams later reached a deal with the Washington Redskins for the 2nd overall selection in the 2012 NFL Draft. The Rams weren't expected to make much of a leap following their dismal campaign the year before, but behind strong play by Bradford and rookies stepping up to the challenge, the Rams finished 7-8-1. In Week 2, against the Washington Redskins, he finished with 310 passing yards, three touchdowns, and one interception in the 31–28 victory. In Week 15, against the Minnesota Vikings, he had 377 passing yards, three touchdowns, and one interception in the 36–22 loss. Bradford finished the season with career best numbers: 3,702 passing yards, 21 touchdowns compared to 13 interceptions and an 82.6 passer rating to go along with 59.5 completion percentage. With all the additions in the off-season, the Rams and Bradford were expected to excel in 2013. The season started off on a positive note with a 27–24 victory over the Arizona Cardinals. In the game, Bradford had 299 passing yards, two touchdowns, and an interception. In the next game against the Atlanta Falcons, he had 352 passing yards, three touchdowns, and one interception as the Rams fell 31–24. After two losses to the Dallas Cowboys and San Francisco 49ers, he had 222 passing yards and three touchdowns in a 34–20 victory over the Jacksonville Jaguars. For the second straight game, he threw for three touchdowns in a 38–13 victory over the Houston Texans. However, during the Rams Week 7 game against the Carolina Panthers, Bradford tore his left ACL on a run out of bounds after a hit from safety Mike Mitchell, ending his season. On the 2013 season, Bradford passed for 1,687 yards and 14 touchdowns to 4 interceptions and 90.9 passer rating. The Rams missed the playoffs with a 7–9 record. Bradford suffered an injury to the same ACL after being sacked during a preseason game against the Cleveland Browns and missed the entire 2014 season. On March 10, 2015, Bradford was traded to the Philadelphia Eagles along with a 2015 fifth round pick, in exchange for Nick Foles, a 2015 fourth-round pick, and a 2016 second-round pick. In his first game as a Philadelphia Eagle, Bradford completed 36 out of 52 passes for a touchdown and two interceptions in a season opening 26–24 loss to the Atlanta Falcons. In Week 4, he threw three touchdowns with zero interceptions, and although his completion percentage was lower than 55% in both games, he still mustered a 122.6 passer rating in a loss to the Redskins, his only passer rating above 90 for the season. In Week 6, he threw three interceptions, but the Eagles still gained a 27–7 win over the New York Giants to move Philadelphia to 3–3 and in first place in the NFC East, mainly thanks to the defense and run game. Bradford had his worst game by far in a loss against the Panthers, where he completed only 56.5% of his passes with zero touchdowns, one interception, and a quarterback rating of 58.7. Against the Miami Dolphins on November 15, Bradford suffered a left shoulder injury as well as a concussion, which would keep him out of the next two games against Tampa Bay and a Thanksgiving Day game against Detroit In his first season, Bradford would go 7-7 as a starter and his play began to improve after Week 9 against the Dallas Cowboys. Before week 9, Bradford has been playing poorly through his first seven games, but Eagles coach Chip Kelly would not bench him, but during Week 9, Bradford threw a game-winning touchdown in overtime to Jordan Matthews. In Week 13, Bradford led the Eagles to a 35–28 upset over the New England Patriots. In Week 15, Bradford threw for 361 yards, two touchdowns, and two interceptions in a 40–17 loss to the Arizona Cardinals. In Week 16, he threw for 380 yards and a touchdown in a 38–24 loss to the Washington Redskins. In the regular season finale against the New York Giants, he threw for 320 yards, two touchdowns, and one interception in the 35–30 victory. The Eagles finished with a 7–9 record and missed the playoffs. On March 1, 2016, Bradford signed a 2-year, $36 million ($26 million guaranteed) contract extension with the Eagles. However, the Eagles traded with the Cleveland Browns for the number two pick in the 2016 NFL draft, in order to draft a new quarterback. This led to speculation that Bradford would be traded or used as a stopgap while Chase Daniel educates the newly drafted quarterback in Pederson's offensive scheme. On April 25, 2016, it was reported that Bradford wanted to be traded and that he would no longer attend the team's off-season activities. The Eagles selected quarterback Carson Wentz with the second overall pick in the 2016 draft on April 28. Bradford returned to the team in May 2016. On September 3, 2016, following his appearance in the Eagles' preseason matches, Bradford was traded to the Minnesota Vikings for a first-round pick in the 2017 NFL Draft (later used to select Derek Barnett) and a conditional fourth-round pick in the 2018 NFL Draft. The trade was made after Vikings quarterback Teddy Bridgewater suffered a season-ending ACL tear during team practice on August 30, 2016. 15 days after being traded, Bradford made his first start for the Vikings in Week 2 against the Green Bay Packers. Despite not having much time to learn the offense, Bradford outplayed Aaron Rodgers but ended up hurting his left hand in the first half due to a hit by Clay Matthews. Bradford finished the game completing 22-of-31 passes for 286 yards and two touchdowns, helping lead the Vikings to their first win in their new stadium. His first touchdown as a Viking came in the second quarter on an eight-yard pass to tight end Kyle Rudolph in the back of the end zone, while the second touchdown of the night was a 25-yarder to Stefon Diggs late in the third quarter that gave the Vikings a 17-7 lead. The connection between both players resulted in 182 yards on 9 catches for Diggs, a career-high for him. Bradford received high praise from the media, with many calling it one of the best games of his career. The following week, Bradford threw for 171 yards and one touchdown in a 22-10 win against the Carolina Panthers, thanks to a strong Vikings' defense that sacked Cam Newton eight times and intercepted him three times. In the Vikings' win over the New York Giants in Week 4, Bradford threw a touchdown pass and did not throw an interception for the third straight game. The only other Vikings player to do that in each of his first three games of a season was Randall Cunningham in 1998. With both starting tackles and Stefon Diggs (Vikings' leading receiver) out for a Week 5 game against the Houston Texans, Bradford delivered another strong performance, completing 22 of 30 passes for 271 yards, two touchdowns and, for the fourth straight start, not a single interception. In the opening drive, he connected with Adam Thielen on a 36-yard touchdown strike. During a three-game losing streak, Bradford threw only three touchdowns and an interception with 725 yards and a 66% completion percentage, poor in comparison with the previous four games, in which he threw for 990 yards, six touchdowns, no interceptions, and had a 70% completion percentage. The Vikings would finish the season with an 8-8 record. Bradford started 15 games in 2016, completing 395 of 552 passes for 3,877 yards and 20 touchdowns with 5 interceptions. His 71.6 completion percentage set a single season NFL record, passing Drew Brees's 2011 mark of 71.2. Brees later finished the 2017 season with a 72.0 completion percentage, retaking the record. Bradford's 395 completions set a franchise record for completions in a season. In Week 1, on Monday Night Football, Bradford completed 27-of-32 pass attempts for 346 yards and 3 touchdowns in a 29–19 win over the New Orleans Saints, earning him his first NFC Offensive Player of the Week award. He was inactive for the Week 2 game against the Pittsburgh Steelers due to a knee injury. After missing three more games, on October 10, it was revealed that Bradford was diagnosed with wear and tear on his knee after two previous ACL surgeries. On November 7, Bradford underwent a knee scope, putting his season in jeopardy. He was placed on injured reserve the next day, ending his season. On January 13, 2018, Bradford was activated off injured reserve to the active roster for the divisional round of the playoffs against the New Orleans Saints, however Case Keenum started the game due to his strong season. On March 16, 2018, Bradford signed a two-year contract with the Arizona Cardinals worth up to $20 million the first year with $15 million guaranteed with a potential out after 2018. Bradford wore number 9 with the Cardinals, due to number 8 having been retired in honor of Hall of Fame safety Larry Wilson. After ineffective performances in the first two games, both blowout losses, Bradford was pulled in favor of rookie Josh Rosen in the final moments of a Week 3 loss to the Chicago Bears. As the Cardinals decided to keep Rosen as their starting quarterback, Bradford was inactive for the next five weeks before ultimately being released on November 3, 2018. Bradford is 1/16th Cherokee and is listed as an official citizen on the Cherokee Nation tribe's rolls. Bradford was the first person of identified Cherokee descent to start at quarterback for a Division I university since Sonny Sixkiller, a full-blooded Cherokee, who played for the University of Washington during the 1970–1972 seasons. His father, Kent Bradford, was an offensive lineman for the Sooners from 1977 to 1978. Bradford is an avid ice hockey fan. His favorite team is the Vancouver Canucks. Bradford is a scratch golfer and was also a basketball player in high school. Bradford, a born-again Christian, appeared in a short film of video testimonials from celebrities called I Am Second, sharing his faith about Christianity and winning the Heisman Trophy. In 2009, Oklahoma City mayor Mick Cornett declared January 13 as "Sam Bradford Day" in Oklahoma City. ^ "Official Site of the Oklahoma Sooners". SoonerSports.com. September 22, 2010. Archived from the original on September 25, 2010. Retrieved September 27, 2010. ^ "Vikings QB Sam Bradford was an all-everything athlete until football won out". Twin Cities. September 24, 2016. Retrieved January 25, 2018. ^ "The Oklahoman's Big All-City Football team: Roster and player profiles". newsok.com. December 19, 2004. Retrieved May 23, 2017. ^ "BOYS ALL-STATE ROSTER". newsok.com. April 10, 2005. Retrieved May 23, 2017. ^ a b "14 Sam Bradford". SoonerSports.com. Retrieved September 11, 2007. ^ Maisel, Ivan (November 30, 2007). "Oklahoma's rookie QB makes college game looks easy". ES-28PN. Retrieved November 30, 2007. ^ "Sam Bradford: All-American everything". philly.com. Retrieved May 23, 2017. ^ Thamel, Pete (December 13, 2008). "Bradford Wins Heisman, but the Top Prize Awaits". New York Times. ^ "Football Recruiting – Quarterback". Scout.com. Retrieved September 11, 2007. ^ "Sam Bradford 2008 Game Log". College Football at Sports-Reference.com. Retrieved January 13, 2018. ^ "BCS Championship - Oklahoma vs Florida Box Score, January 8, 2009". College Football at Sports-Reference.com. Retrieved January 13, 2018. ^ "2009 Oklahoma Sooners Stats". College Football at Sports-Reference.com. Retrieved January 13, 2018. ^ "Bomar, Quinn dismissed from OU football team". NewsOK.com. August 3, 2006. Retrieved November 9, 2017. ^ "2006 Oklahoma Sooners Stats". College Football at Sports-Reference.com. Retrieved November 9, 2017. ^ "2006 Oklahoma Sooners Schedule and Results". College Football at Sports-Reference.com. Retrieved November 9, 2017. ^ "2007 Oklahoma Sooners Roster". ^ "Bradford Gets Nod at Quarterback". SoonerSports.com. Archived from the original on October 7, 2007. Retrieved August 21, 2007. ^ Carlson, Jenni (September 2, 2007). "Sooner newbies Bradford, Murray debut with monster games". NewsOK.com. Retrieved September 4, 2007. ^ Trotter, Jake (September 9, 2007). "Sooners' Bradford proves that he belongs". NewsOK.com. Retrieved September 10, 2007. ^ "Bradford Captures Camp Honor". SoonerSports.com. September 9, 2007. Archived from the original on December 4, 2008. Retrieved September 10, 2007. ^ "Oklahoma Rocks Miami, 51–13". SoonerSports.com. Archived from the original on October 13, 2007. Retrieved September 10, 2007. ^ "The Sports Network I-A College Football". The Sports Network. Retrieved November 18, 2007. ^ "ESPN – Sooners QB Bradford to be reevaluated this week – College Football". ESPN. Retrieved November 21, 2007. ^ "Bradford's early exit in '07 means Tech still has to size up Sam". sportsline.com. Retrieved May 23, 2017. ^ "Patrick runs for career-best 202 yards, 2 TDs as OU rolls". ESPN. November 24, 2007. Retrieved November 24, 2007. ^ "Missouri at Oklahoma Box Score, October 13, 2007". College Football at Sports-Reference.com. Retrieved January 13, 2018. ^ "Oklahoma vs Missouri Box Score, December 1, 2007". College Football at Sports-Reference.com. Retrieved November 9, 2017. ^ "Fiesta Bowl - West Virginia vs Oklahoma Box Score, January 2, 2008". College Football at Sports-Reference.com. Retrieved November 9, 2017. ^ "Jenni Carlson exclusive: Bradford blossoms under Heupel's helping hand". NewsOK.com. October 19, 2008. Retrieved November 9, 2017. ^ "Oklahoma vs Missouri Box Score, December 6, 2008". College Football at Sports-Reference.com. Retrieved November 9, 2017. ^ "2008 Oklahoma Sooners Stats". College Football at Sports-Reference.com. Retrieved November 9, 2017. ^ "BCS Championship - Oklahoma vs Florida Box Score, January 8, 2009". College Football at Sports-Reference.com. Retrieved November 9, 2017. ^ a b "Bradford is winner of O'Brien QB award". ^ "SAM BRADFORD OF THE UNIVERSITY OF OKLAHOMA SELECTED AS THE 2008 HEISMAN WINNER". heisman.com. Archived from the original on December 17, 2008. Retrieved May 23, 2017. ^ "Heisman U? Sam Bradford is latest in impressive run of OU signal-callers". ^ "Bradford wins 2008 Heisman Trophy". ^ "OU's Sam Bradford wins 74th Heisman Trophy". ^ "Oklahoma QB Bradford wins Heisman Trophy". ^ "NCAAF on Yahoo! Sports - News, Scores, Standings, Rumors, Fantasy Games". Yahoo Sports. Retrieved May 23, 2017. ^ Dufresne, Chris (January 5, 2009). "Sam Bradford and Tim Tebow are Heismans apart". Los Angeles Times. Retrieved May 23, 2010. ^ "Florida Gators vs. Oklahoma Sooners Box Score, January 8, 2009". ^ "Sam Bradford Will Return to Oklahoma". SI.com. January 14, 2009. Archived from the original on January 21, 2009. ^ "BYU vs. Oklahoma - Game Recap - September 5, 2009 - ESPN". ESPN.com. Retrieved May 23, 2017. ^ "Hall's TD pass with 3:03 remaining lifts Cougars over No. 3 Sooners". ESPN.com. Associated Press. September 5, 2009. Retrieved September 5, 2009. ^ Baldwin, Mike (September 21, 2009). "OU's Bob Stoops: Sam Bradford still questionable for Miami". The Oklahoman. Retrieved December 19, 2010. ^ "Big 12: Even with Bradford, Sooners beatable". ^ a b "SN's 2007 college football All-Americans". Archived from the original on December 12, 2007. ^ "Nolan Nawrocki's All-America team". ^ "2007 CFN All-America Teams". Archived from the original on December 20, 2009. ^ "SI.com's 2007 All-Americas". CNN. December 11, 2007. Retrieved May 23, 2010. ^ "2007 All-Big 12 Football Awards Announced". ^ "2007 Academic All-Big 12 Football Team Announced" (PDF). ^ "2008 ESPN THE MAGAZINE Academic All-America" (PDF). ^ "2008 Academic All-Big 12 Football Team Announced" (PDF). ^ "2008 All-Big 12 Football Awards Announced". ^ "CBSSports.com 2008 All-America Team". Archived from the original on December 15, 2008. ^ "Rivals.com 2008 All-America Teams". Archived from the original on December 11, 2008. ^ "Associated Press names 2008 All-America Team". ^ "Sporting News' college football All-American First Team". Archived from the original on December 21, 2008. ^ "Heisman Finalists". The Washington Post. December 13, 2008. Retrieved May 23, 2010. ^ "AP College Football Player of the Year Winner". ^ "Touchdown Club News, Awards". March 27, 2009. Archived from the original on May 25, 2011. ^ "NCAA Quarterback of the Year". Touchdown Club of Columbus. April 6, 2009. Archived from the original on December 5, 2012. ^ Perloff, Andrew (April 28, 2009). "(Way early) 2010 NFL Mock Draft". SI.com. ^ McShay, Todd (April 30, 2009). "QBs Sam Bradford and Colt McCoy are high in Todd McShay's early 2010 mock draft". ESPN.com. ^ Perloff, Andrew (April 28, 2009). "Sam Bradford goes No.1 to St. Louis Rams in 2010 NFL Mock Draft". Sports Illustrated. ^ Jeremiah, Daniel (February 26, 2009). "Oklahoma QB Sam Bradford measured at 6'4​1⁄4, 236 pounds at Friday's weigh-in". Rotoworld.com. ^ "Sam Bradford, DS #1 QB, Oklahoma". Retrieved November 8, 2012. ^ "It's finally official: Rams take Bradford". St. Louis Post-Dispatch. April 22, 2010. Archived from the original on April 25, 2010. ^ "Oklahoma Drafted Players/Alumni". Pro-Football-Reference.com. Retrieved November 9, 2017. ^ "Bradford changes jersey number to honor Aikman". USA Today. April 25, 2010. 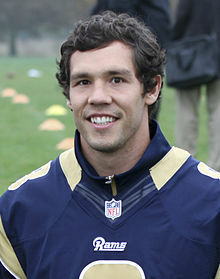 ^ "BREAKING: St. Louis Rams Sign Sam Bradford". fantasyknuckleheads.com. Retrieved May 23, 2017. ^ Schefter, Adam (July 31, 2010). "Bradford, Rams Agree On Record-Breaking Deal". ESPN.com news services. Retrieved September 11, 2010. ^ Mortensen, Chris (August 15, 2010). "Sam Bradford not pressing to start". ESPN.com. Retrieved August 15, 2010. ^ "Watch St. Louis Rams vs. New England Patriots [08/26/2010] - NFL.com". www.nfl.com. Retrieved January 13, 2018. ^ Maske, Mark (September 4, 2010). "Sam Bradford named Rams' starter". Washington Post. Retrieved September 11, 2010. ^ "Arizona Cardinals at St. Louis Rams - September 12th, 2010". Pro-Football-Reference.com. Retrieved November 9, 2017. ^ "Washington Redskins at St. Louis Rams - September 26th, 2010". Pro-Football-Reference.com. Retrieved November 9, 2017. ^ "Seattle Seahawks at St. Louis Rams - October 3rd, 2010". Pro-Football-Reference.com. Retrieved November 9, 2017. ^ "Carolina Panthers at St. Louis Rams - October 31st, 2010". Pro-Football-Reference.com. Retrieved November 9, 2017. ^ "Rams at .500 as Sam Bradford tosses two TDs". ESPN.com. October 31, 2010. ^ "NFL Game Center: Atlanta Falcons at St. Louis Rams - 2010 Week 11". NFL.com. November 21, 2010. Archived from the original on November 20, 2010. ^ Sando, Mike (November 29, 2010). "Sam Bradford's performance in perspective". ESPN.com. Retrieved November 29, 2010. ^ Thomas, Jim (December 30, 2010). "The Rams' rock at quarterback". St. Louis Post-Dispatch. ^ Farmer, Sam (January 1, 2011). "Rams' Sam Bradford has displayed an unexpected quality: durability". Los Angeles Times. ^ "Sam Bradford 2010 Game Log". Pro-Football-Reference.com. Retrieved January 25, 2018. ^ "Sam Bradford 2011 Game Log". Pro-Football-Reference.com. Retrieved January 25, 2018. ^ "2011 St. Louis Rams Statistics & Players". Pro-Football-Reference.com. Retrieved November 9, 2017. ^ Schefter, Adam. "Redskins acquire No. 2 pick from Rams". ESPN.com. Retrieved November 9, 2017. ^ "2012 NFL Standings & Team Stats". Pro-Football-Reference.com. Retrieved January 25, 2018. ^ "Washington Redskins at St. Louis Rams - September 16th, 2012". Pro-Football-Reference.com. Retrieved January 25, 2018. ^ "Minnesota Vikings at St. Louis Rams - December 16th, 2012". Pro-Football-Reference.com. Retrieved January 25, 2018. ^ "Sam Bradford 2012 Game Log". Pro-Football-Reference.com. Retrieved November 9, 2017. ^ "Arizona Cardinals at St. Louis Rams - September 8th, 2013". Pro-Football-Reference.com. Retrieved January 25, 2018. ^ "St. Louis Rams at Atlanta Falcons - September 15th, 2013". Pro-Football-Reference.com. Retrieved January 25, 2018. ^ "Jacksonville Jaguars at St. Louis Rams - October 6th, 2013". Pro-Football-Reference.com. Retrieved January 25, 2018. ^ "St. Louis Rams at Houston Texans - October 13th, 2013". Pro-Football-Reference.com. Retrieved January 25, 2018. ^ "Source: Rams QB Bradford suffers torn ACL". ESPN.com. Retrieved November 9, 2017. ^ "Sam Bradford 2013 Game Log". Pro-Football-Reference.com. Retrieved November 9, 2017. ^ "2013 St. Louis Rams Statistics & Players". Pro-Football-Reference.com. Retrieved January 25, 2018. ^ Sessler, Marc. "Sam Bradford out for season with torn ACL". NFL.com. Retrieved November 9, 2017. ^ Sheridan, Phil. "QBs Bradford, Foles swap teams". ESPN. Retrieved March 11, 2015. ^ "Watch Philadelphia Eagles vs. Atlanta Falcons [09/14/2015] - NFL.com". www.nfl.com. Retrieved September 20, 2015. ^ "Philadelphia Eagles at Washington Redskins - October 4th, 2015". Pro-Football-Reference.com. Retrieved November 9, 2017. ^ "NY Giants 7 - 27 Philadelphia: Final - 2015-10-19 - National Football League - Yahoo! Sports". Yahoo Sports. Retrieved May 23, 2017. ^ "Philadelphia Eagles at Carolina Panthers - October 25th, 2015". Pro-Football-Reference.com. Retrieved November 9, 2017. ^ Sheridan, Phil (November 15, 2015). "Sam Bradford injures shoulder, gets concussion; X-rays negative". ESPN.com. ^ "Sam Bradford 2015 Game Log". Pro-Football-Reference.com. Retrieved November 9, 2017. ^ "Philadelphia Eagles at Dallas Cowboys - November 8th, 2015". Pro-Football-Reference.com. Retrieved November 9, 2017. ^ "Philadelphia Eagles at New England Patriots - December 6th, 2015". Pro-Football-Reference.com. Retrieved November 9, 2017. ^ "Arizona Cardinals at Philadelphia Eagles - December 20th, 2015". Pro-Football-Reference.com. Retrieved January 25, 2018. ^ "Washington Redskins at Philadelphia Eagles - December 26th, 2015". Pro-Football-Reference.com. Retrieved January 25, 2018. ^ "Philadelphia Eagles at New York Giants - January 3rd, 2016". Pro-Football-Reference.com. Retrieved January 25, 2018. ^ "2015 Philadelphia Eagles Statistics & Players". Pro-Football-Reference.com. Retrieved January 25, 2018. ^ "Sam Bradford demands trade after Eagles' move for No. 2 pick". espn.go.com. April 25, 2016. Retrieved April 25, 2016. ^ Patra, Kevin (May 9, 2016). "Sam Bradford reports for Eagles voluntary workouts". nfl.com. Retrieved September 3, 2016. ^ Orr, Conor. "Sam Bradford traded to Vikings for two draft picks". ^ Smith, Alex. "Sam Bradford Traded To Minnesota". Archived from the original on May 21, 2017. ^ Goessling, Ben (August 30, 2016). "Vikings QB Teddy Bridgewater dislocates knee, tears ACL in drill". espn.com. Retrieved August 30, 2016. ^ "Green Bay Packers at Minnesota Vikings - September 18th, 2016". Pro-Football-Reference.com. Retrieved January 13, 2018. ^ Wilson, Ryan. "Dominant Sam Bradford outplays Aaron Rodgers in Vikings debut: 8 takeaways". cbssports.com. Retrieved May 23, 2017. ^ "Peter King on Sam Bradford's Performance vs. Packers: 'Best Night as a Pro'". vikings.com. Archived from the original on November 10, 2017. Retrieved May 23, 2017. ^ "Minnesota Vikings at Carolina Panthers - September 25th, 2016". Pro-Football-Reference.com. Retrieved November 9, 2017. ^ "Elias Says". ESPN.com. Retrieved May 23, 2017. ^ "Sam Bradford stands out for Vikings despite loss of another starting lineman". startribune.com. Retrieved May 23, 2017. ^ "Sam Bradford". ESPN.com. Retrieved May 23, 2017. ^ "2016 Minnesota Vikings Statistics & Players". Pro-Football-Reference.com. Retrieved January 13, 2018. ^ "Sam Bradford". nfl.com. Retrieved January 1, 2017. ^ Graf, Dan (January 1, 2017). "Sam Bradford — Sam Bradford! — is the most accurate QB in NFL history". foxsports.com. Retrieved January 1, 2017. ^ Young, Lindsey (January 1, 2017). "Sam Bradford Breaks NFL Record, Team Records in Season Finale". vikings.com. Archived from the original on January 3, 2018. Retrieved January 2, 2017. ^ Patra, Kevin (September 17, 2017). "Sam Bradford won't play Sunday due to sore knee". nfl.com. Retrieved September 17, 2017. ^ Shook, Nick. "Sam Bradford dealing with wear and tear to knee". NFL. Retrieved October 10, 2017. ^ Shook, Nick. "Sam Bradford undergoes knee scope, could land on IR". NFL. Retrieved November 8, 2017. ^ Peters, Craig (November 8, 2017). "Vikings Activate Teddy Bridgewater, Place Sam Bradford on Injured Reserve". Vikings.com. Archived from the original on December 13, 2017. ^ Peters, Craig (January 13, 2018). "Vikings Activate Sam Bradford". Vikings.com. Archived from the original on February 2, 2018. ^ Urban, Darren (March 16, 2018). "Sam Bradford Officially Joins Cardinals". AZCardinals.com. Archived from the original on March 17, 2018. ^ Weinfuss, Josh (March 30, 2018). "Sam Bradford to wear No. 9 as Cardinals newcomers get numbers". ESPN.com. Retrieved January 23, 2019. ^ Patra, Kevin (September 23, 2018). "Josh Rosen replaces Sam Bradford late in Cards loss". NFL.com. ^ Shook, Nick. "Cardinals release Sam Bradford after eight weeks". NFL.com. Retrieved November 3, 2018. ^ "NFL Single-Season Pass Attempts Leaders". pro-football-reference.com. Sports Reference LLC. Retrieved April 22, 2016. ^ Sielski, Mike (January 5, 2016). "Sam Bradford shows he's worth bringing back". articles.philly.com. Retrieved April 22, 2016. ^ "BCS National Championship: OU quarterback Sam Bradford inspiration to American Indians". ^ Wieberg, Steve (December 9, 2008). "Native son: Okla. QB Bradford brings pride to Cherokees". USA Today. Retrieved May 23, 2010. 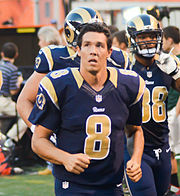 ^ "Sam Bradford 'a role model' among Native Americans". ^ "Kent Bradford - SoonerStats - Oklahoma Sooners Football, Basketball, Baseball, and Softball Scores, Records, and Stats". www.soonerstats.com. Retrieved May 23, 2017. ^ "U.S. college football star shows love for Canucks". ^ Rom, Clements (April 24, 2010). "Sam Bradford Becomes Face of the Franchise in St. Louis". Bleacher Report.com. Retrieved September 11, 2010. ^ "Sam Bradford - I Am Second". Retrieved August 12, 2011. ^ "Oklahoma City mayor declares Sam Bradford Day in city". NewsOK.com. January 13, 2009. Retrieved September 27, 2010. Wikimedia Commons has media related to Sam Bradford.